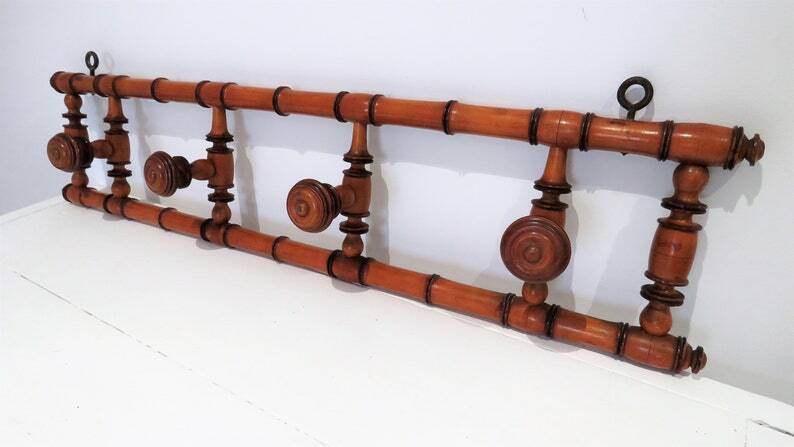 This vintage French, solid wood, faux bamboo coat rack, has four pegs and is so typically French. You can attach the coat rack to your wall, by screwing through the 2 hooks, on the back. This is entirely hand made, from solid turned wood. All of the pegs swivel so they can be tucked away if needed. Hang in the kitchen for tea towels, aprons, bags. Or in the bathroom for housecoats, towels etc. Or as it's original use, in the hallway for hats and coats. In very good vintage condition. Honey brown, lovely aged patina. It is very French and is Chinoiserie in style. Chinoiserie is a European art style, reflecting Chinese influence and adapting Oriental designs, patterns and motifs to European decorative objects. 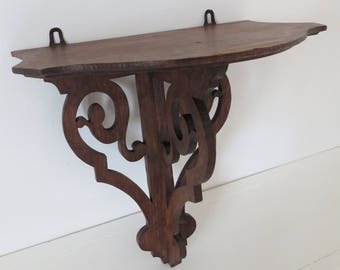 For example, while this hat coat rack is made entirely from solid turned wood, it was designed to resemble Oriental bamboo, as if it were made from bamboo rather than wood.